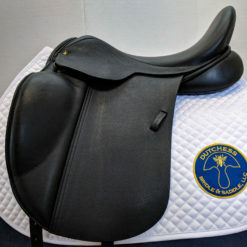 Signup for our newsletter to get notified about sales, important updates, and tips to keep your tack in top shape. 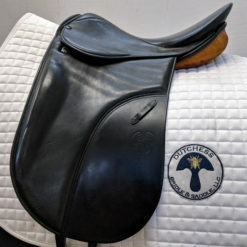 This Albion Platinum Genesis dressage saddle is about 10 years old and in very good condition! 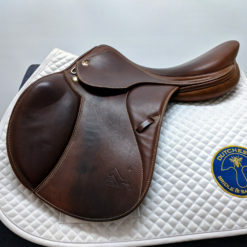 The saddle features Albion’s premium “Ultima” leather options: very soft shaped knee pad and seat, with textured leather skirts and flaps. Comes with Velcro blocks! The “Genesis” tree can be adjusted to fit your horse by any saddle fitter. The tree is currently set to 295cm, fitting about a Medium. All saddle sales are final. 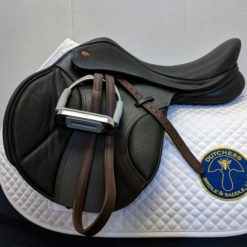 We strongly recommend taking this saddle for a trial before purchase to ensure the best fit for you and your horse. HORSE FIT DESCRIPTION: This saddle would fit a medium, A-shaped wither with some hollowing behind the shoulders and a low, level back. RIDER DESCRIPTION: The narrow twist and moderate width of seat make for a close ride in this deep-seated saddle. Large, supportive thigh blocks and a relatively straight flap put the rider in a classically correct position. 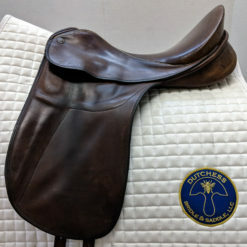 All saddle sales are final, so please take this saddle for a trial before purchase to ensure the best fit for you and your horse! MEASUREMENT DISCLAIMER: The fit of every saddle is unique! 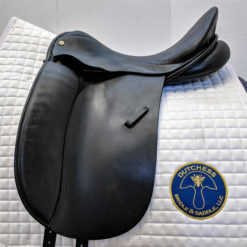 All measurements provided have been taken directly from saddle stamps or are approximate measurements taken by DBS staff. This information is provided as a courtesy and is not a guarantee of size or fit. Get the latest deals, news, and tips to get the most out of your tack. Your personal data will be used to support your experience throughout this website and to manage access to your account.